Ethash DAG epoch RX470/480/570/580 FIX !! Bitcoin Forum > Alternate cryptocurrencies > Mining (Altcoins) (Moderator: mprep) > Ethash DAG epoch RX470/480/570/580 FIX !! Dear friends, I would like to share with you fix for well known DAG problem on RX polaris graphics cards, taken from unofficial beta driver of AMD. Install driver via Device manager, right click on your card and point to unpacked folder what you previously download from one of the links above. 2. Install well known patcher (atikmdag-patcher), link below. IMPORTANT: You must use Clymore's Dual latest version, at the moment v9.8. If you want to use AB for clock to then you must download and install latest beta 16 version, but first you need to uninstall version you are using, also delete all the files in ProgramFiles. Tested, confirmed, AB 4.4.0 beta16 working fine. I personally test on all RX models, from my experience RX470/480 no problem. I put this driver on really huge pool and what to tell you guys, hash result is awesome. Tested on win10 on all rigs. 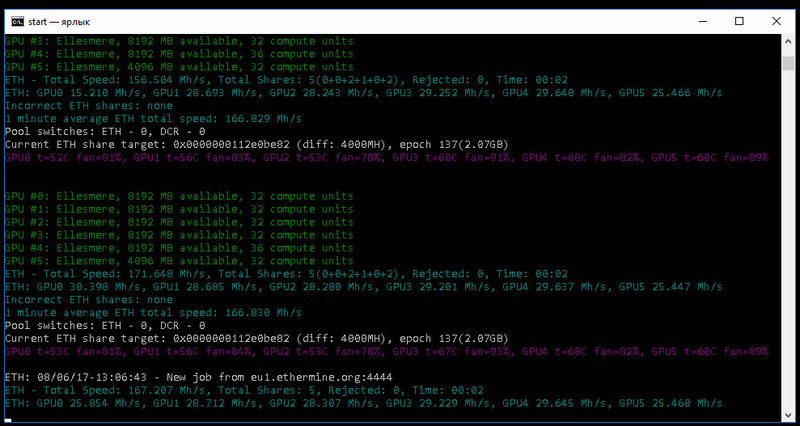 Re: Ethash DAG epoch RX470/480/570/580 FIX !! Can you mention the hashrate difference? how much were you getting on eth on the previous dricers vs this one? It depends the memory and clock, I say you will get back around 3% per card. Mind you I would not use it if I were you, too many bugs. You trolls should wait for the official release if there will be one. Yeah, in the end is not worth using this driver if not undervolting. Kind pointless, maybe that is why they broke everything, they wanted undervolting to be pointless. I guess we will have to wait for 3rd party software updates. I just want to mention, this driver is used for more then a week, I personally use it and my friend with huge pool, with more then 600 gpu's, all of them 470/480, working like a charm. 3. For voltage use AB, it is working well. I personally test, voltage control working fine via AB, fan control to, just gpu/mem clocks need to be used via Clymore commands. There is some minor bugs with RX570 cards and new Clymore, but it is also something what can be solved easy. What afterburner version are you using? cause I tried 3 and nothing on sapphire rx 480. I am using standard version, one from MSI site, I think it is 4.3.0. Working well for voltage and fan speed, the rest of options not available with this driver, I also think with last official to(someone can confirm this for 17.7.2), so I don't think that, even if tomorrow there will be official amd release of this driver, this problem with AB will be solved soon. Only in case if MSI release new version. WARINING! For this drivers need msi afterburner 4.4.0 BETA 15 !!!!!!!!!! or overclocking don't work!!! 32 bit 64 bit ?? where can i download beta 15?